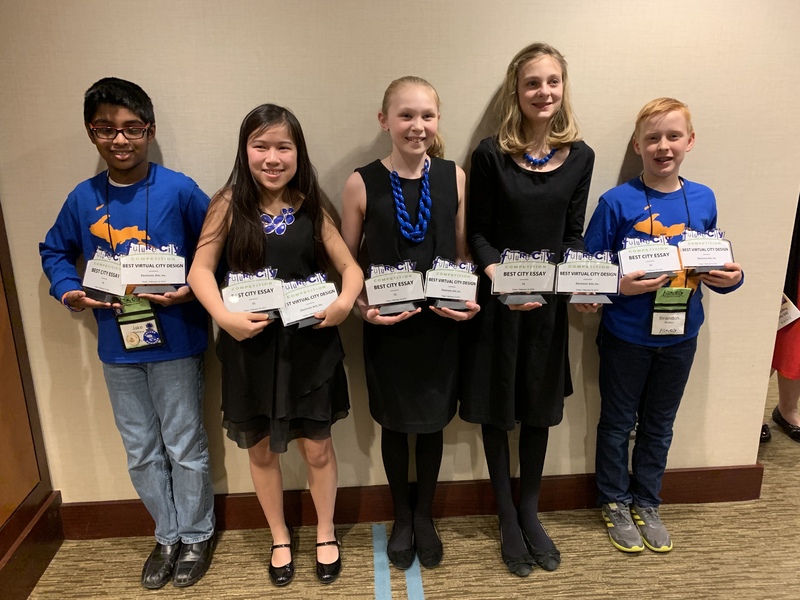 The St. John Lutheran School Future City competition team from earned two of the top three awards at the National Competition on February 19, 2019. The St. John team was awarded Best City Essay, sponsored by Underwriters Laboratories and Best Virtual Design sponsored by Electronic Arts. The team competed at Nationals in Washington DC, held in conjunction with National Engineering Week. Nearly 1,000 guests were in attendance at the awards presentation. The team earned 1st place and Best Project Plan Award at the Regional Future City Competition held on January 29. The Engineering Society of Detroit is the sponsor of the Regional competition, held at the Suburban Showcase Collection in Novi, Michigan. St. John has won the Michigan Regional Championship 13 times, finished in the "Top 10 National" 8 times, and participated in the "Top 5 National" 6 times, including winning back-to-back national championships in 2014 and 2015, the only school ever to achieve this. 2019 is St. John Lutheran School’s 22nd year of participating in the Future City program. Dr. Linda Gerhardt, Global Paint Quality Lead at General Motors, is in her 11th year with the team, now as Educator Engineer and previously as Engineer Mentor. William (Bill) Abramczyk of FCA, is the team’s Engineer Mentor for the 2nd year, with prior experience as a team parent and helping another Detroit area school with their program. Mr. Tim Grothaus is the team’s Teacher Sponsor for the 2nd year. The team’s student presenters were Anna Bochenek, Lily Myers and Emerson Kerska. Jake Matthew and Brandon Raikes are the teams’ alternate presenters, and Jake Matthew is also the team's Virtual Design Lead. There are an additional nine middle school students on the team as well as two 5th grade apprentices. This year’s theme was Powering Your Future, asking participants to develop an electric grid that can withstand and recover quickly from a national disaster. The team chose to place its city in Guanica, Puerto Rico, located on the southwest coast of the island where Columbus landed in 1493. Ponce de Leon established the city in the early 1500’s, and in 2121, Guanica will be known as Des-Monez, which means ‘City of Hope’, which is the name of the team’s city. The team chose a real place that has experienced real problems, including 2 hurricanes in September 2017. Mr. Pablo Santiago and Ms. Nairda Martinez were both in Puerto Rico when a hurricane hit, and they spoke to the team about their experiences. The city focuses on Energy Production and Energy Storage solutions. Future City Competition (futurecity.org) is a national, project-based learning experience where students in 6th, 7th, and 8th grade imagine, design and build cities set at least 150 years in the future. Students work as a team with an educator and engineer mentor to plan cities using SimCity™ software, research and write solutions to an engineering problem, build tabletop scale models with recycled materials, and present their ideas before judges at Regional Competitions in January. Regional winners from around the country and around the then world compete at Nationals held during National Engineers Week in February. Future City is offered at St. John Lutheran School as an Academic Enrichment elective course in Middle School. 5th grade students may attend the after school and weekend meetings as apprentices. Read More about our Future City Team in the News!